The ohrenhoch-Kids are given the great honor of participating in the SinusTon Festival - Magdeburg Days of Electroacoustic Music (from 23 to 26 October 2014). The ohrenhoch-Kids will present "33 1/3" by John Cage and their Sound-space installation "TAGAKTIV" (DIURNAL). The mentor of the ohrenhoch-Kids Knut Remond will hold the workshop for children "Klänge statt Kuchen!" (Sounds instead of cakes!). The ohrenhoch-Kids, between 5 and 12 years old, allude to the theme "Courage" in presenting "33 1/3" (1969) by John Cage continuously, and self-created solo sound performances. Their acquaintance with Sound Art and Electroacoustic Music since several years qualifies the ohrenhoch-Kids to stage a piece of one of the most important composers of the 20th century: "33 1/3" by John Cage. The visitors can participate. The duration of the piece is unlimited. For 33 1/3 by John Cage 8 turntables are placed in the space and numerous diverse 33 1/3 records are placed at the disposal. The visitors can choose from the records. 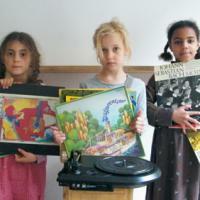 Each turntable has a technical assistant (ohrenhoch-Kids) playing the records. The visitors are the performers because without them nothing is heard. In addition to this the ohrenhoch-Kids conceived their own solo music performances and solo pieces, which they will present in a daredevil approach - parallel to the staging of "33 1/3" by John Cage. "The ohrenhoch Newspaper", created and designed by the ohrenhoch-Kids with own texts and pictures, is published on the occasion of their production "Tollkühn" at the festival.